Those of you looking for the ultimate in canopy function and toughness should check out this Commercial Canopy 100 Shade Tent from Quik Shade. It doesn't get a whole lot better than this high-performance canopy in terms of getting a great canopy at a great price that outperforms pretty much any other canopy out there. That's because the Commercial 100 Canopy Tent brings so much to the table. The one-piece frame is made of heavy-duty powder coated steel for strength and durability. The canopy top is made of Aluminex backed polyester that blocks 100% of harmful UV rays, preventing any long-term skin damage from overexposure to the sun. This package comes with height-adjustable legs, anchor stakes for added stability, and a heavy-duty roller bag that makes transportation simple. There isn't a whole lot more you could want in a canopy package. The combination of quality, function, and value is unmatched in the canopy industry. If you're looking for the best canopy at the best price, the Commercial 100 Canopy Tent is the perfect choice. What is the length and width of the carrying case? What is cross section dimension of telescoping legs? The diameter of the legs on this unit is 30 mm. Is this tent waterproof or water resistant? This model features a 300 denier water-resistant polyester top. Can we buy the shade separate from the frame? I know this tent is 10 x 10, but what is the height? This tent has a 9-ft., 11-in. maximum peak height. Does it come with a carrying case? What is the size when stored? Thank you. This unit comes with a heavy-duty roller bag with shoulder straps. The folded frame measures 47.9 in. L x 9.3 in. W x 9.3 in. D.
Can one person set up and take down this canopy alone? Shorter customers will have a hard time assembling the tent alone, but it is quite possible. You will have to properly secure one leg of the frame where a second person would normally be and pull the frame away from this end on the opposite side. You will then need to extend the canopy legs individually and perform the remaining steps described in the installation manual. If you have to handle it alone, it is definitely possible. It works much better with 2 people standing on opposite corners slowly moving the posts up to the desired height (diagonally across from each other). Then move to the other 2 corners & position those posts also. I can but it is FAR EASIER with 2 people on opposite corners. It requires moderate strength to lock the corners once opened. If you are handy or have had any experience with this type canopy it can be done by one person. Yes, I do it every Sunday at the swap meet. Can you get sides with this tent? Yes the Quik Shade 4-Wall Canopy Kit for C100 and W100 Canopies is available. I see several similar items which tells you to take this down in rain. Is this suitable for being used in rain as well as sun? It would not be recommended to leave this canopy or any of the pop up canopies that we offer up in inclement weather including heavy wind and rain. I'm curious if this can be used on cement or just grass? If so, how does it affix to cement? Any of our popup style canopies may be used on concrete with proper weights, however, if you are looking to have the canopy be permanently secured to concrete via anchors, popup canopies should not be considered as they should not be left in the elements for extended periods of time. For this, a frame or pole tent should be considered. Are the feet of this QUik Shade Commercial 100 canopy tent made out of steel? Do the feet have holes to screw down onto a deck? Thank you for your inquiry. Yes, the foot pad does have 2 holes so you can screw down to secure. This canopy is not a permanent structure to keep up day after day. I would say yes to both of your questions. This is very well built with heavy duty construction. What is the wind load and wind capacity of this Quik Shade Commercial 100 canopy tent? Thank you for your inquiry. The pop up style canopies are not wind rated. You will need to use your judgement if the wind is too strong to avoid damage. Please note you will need to keep any rain from pooling on the top as well to avoid leaking and damage. Not sure about that. It was recommended to us that we fill a bucket with sand or water an attach to the top of the cage in the middle of the inside. That will hold it down well. Rick, I don't have the technical information that you are requesting, but I can tell you about my recent experience. I live in SC and I am sure that you have seen what the recent tornado did to our state. I am an avid Clemson fan and go to all the games. Last Saturday, I took my tent to the Clemson vs Notre Dame game and set it up like I normally do, but this game was different. It had high winds (don't know how high but higher than anytime before) and torrential rains. I did not have my tent anchored mechanically, and it did great.I believe that it is heavy duty enough to sustain a lot more than the other brands. Hope this helps. What is the UPF rating or this Quik Shade Commercial 100 canopy? The canopy top is made of Aluminex backed polyester that blocks 100% of harmful UV rays, preventing any long-term skin damage from overexposure to the sun. Is there any way to attach guy wires to this Quik Shade Commercial canopy? Is there a way that it can be done even inside the frame corners? I'm not exactly sure about the wire you want to attach but I live ina rather windy state and I leave my 10x10 commercial canopy up year round. To secure it I attach ropes through the corner bars and tie it to concrete posts as well as the weights. That was very easy to do. Yes. I believe you could attach guy wires as the frame is sturdy. It is more sturdy than any other canopy that I have used. I love it. It is on cement in my driveway to cover my GEM. What kind of IR protection does this tent provide? The manufacturer does not have a specific rating for IR protection. The canopy does have 100% UV protection, however. I have the sides for the Quik Shade weekender canopy that was destroyed during an art show. Will those sides fit on this C100 canopy? If you previously had the 10 x 10, straight leg QuikShade Weekender 100 canopy, then they will also fit the 10 x 10 QuikShade Commercial 100 straight leg canopy. All of the pop up canopies will require that the canopy be attached as a separate step. The reason for this is that if the frame is folded up with the canopy attached, there is a risk of the fabric getting pinched in the frame and possibly causing damage to the top. Once out of the box the canopy required a two step set-up; the frame first then setting the fabric on second. Afterward they were affixed the 10 x 10 canopy remained on the frame. Is there a weight limit to what may be hung from the interior frame? It is not recommended that any additional weight be hung from the interior as it may cause damage to the frame. Is there a flame retardant sticker certification on this product? Yes, the canopy top has a patch sewn onto the top showing the flame certifications. What is the measurements of the valance? It is approximately 9 inches high. How tall is this this tent? This tent offers a 9-ft., 11-in. maximum peak height and a 6-ft., 5-in. maximum valance height. How many people does it take to raise the canopy? 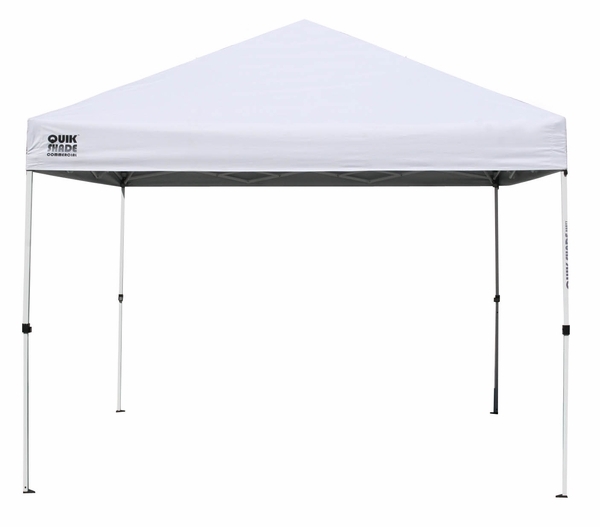 This pop-up style canopy can be set up easily with two people. It is possible that one person could do it as well, depending on the conditions. When you state one piece, is this like the accordion style? Have used this product several times at our local farmer's market and I'm impressed with the quality of the canopy. It is easy to set up (I do it by myself) and looks great! Everything arrived on time in perfect condition! ProsThis canopy was exactly as described and an excellent value. We have a total of 5 of these tents. we love them. Goes up very easily and seems reasonably sturdy. ConsFabric canopy won't last very long as the material is very thin and extremely tight to the frame, but it is light. Not sure how long the thin lattice bracing will last. Design looks pretty good though. Carrying bag is way too tight ... made of thin material, it will bust the seams quickly. ProsLighter than our primary canopy and easy to set up. I am a vendor at a farmers market. I wanted a sturdy tent that protects me from the strong sunshine of Florida. The first day of the market was so windy. Cheap tents went flying. This tent with some weights on 2 corners was steady when gusts hit 35 mph. Thank you. PS it is so easy to put up and take down. The canopy was very easy to set-up. It does a terrific job in keep all our volunters and customers shaded as they purchase book from Friends of the Library in Oceanside CA. We raise hundreds of dollars each year for our local library. The canopy makes a huge difference in our customers and volunteers experience. Plus the price was right and we are happy with the purchase. this is a heavy duty tent that i was looking for. it is very well made and will last me for years. i highly recommend this tent if you don't want to be buying a new tent each and every year. i do wish that the canopy would come in more colors so to match up with purchasers preferrences. it seems that only the cheap tents come with team logo's and color though. Proseasy to put up. sturdy in wind and rain. I purchased this canopy for our annual beach vacation in North Carolina. This canopy is so easy to put up and take down. Very heavy duty. We used is for two weeks and even with the wind we never had to tie it down. I would highly recommend this product! I bought 4 of these for a BBQ event we were having at my work. They were very good quality, easy to set up, and looked really nice. The bags they come in, to store the tent, is also good quality! I would definitely recommend this product and this company. They shipped quickly and I had no issues. Thank you!